Thompson-Ames Historical Society has been offering field-trip experiences for Gilford students for nine years now. Annually students come to the museum buildings to learn first hand what life was like in Gilford when the countryside was dotted with farms, and Gilford Village was a center where farmers and their families could come to, on occasion, to attend church, shop and get mail at the store(s), take grain to the mill to be ground, borrow books from the library, attend meetings and Saturday night suppers at the Grange, go to Town Hall to do business and to vote, etc. Third graders come to enhance their study of the history of Gilford. T-AHS is grateful to the Samuel P. Pardoe Foundation for funding two of the third-grade field trip activities this year -- materials needed in creating quilts for babies and ink, nibs and pens used in writing with quill pens and straight pens. Kindergarteners visit to learn first hand about theGilford historical society’s being one of the Town organizations designed to meet people’s needs. Other classes come whenever they have a special need. -- T-AHS always welcomes the opportunity to help learning come alive for students! Kathy Lacroix has been serving as T-AHS’s Educational Coordinator since 2001, after she retired from teaching at Gilford Elementary School. She is always looking for opportunities to help enhance students’ educational experiences. The year 2006 has offered Thompson-Ames Historical Society the opportunity to provide some out-reach programs for students in Gilford Elementary School’s 4th grade. As Educational Coordinator, Kathy Lacroix was ready! In late winter she coordinated an in-classroom opportunity for the students to learn about harvesting ice in Gilford. Genuine student enthusiasm resulted from a videotape, copies of vintage photos and authentic ice-harvesting tools which Jim Colby and Jerry Lacroix demonstrated and talked about from their own first-hand experiences. Carol Anderson was instrumental in setting up for the fourth graders another outreach activity, Kathy Salanitro’s presentation “Oxen in History”. Kathy Lacroix then scheduled this activity for “the first sunny day” that would happen in Gilford, on or after Tuesday, June 6th. That would be the day when Kathy Salanitro would visit the fourth graders and help them learn about oxen. In-class background would be developed, in part, via a video presentation created by Kathy Salanitro -- and, then, one class at a time would have the novel opportunity to go outdoors (in front of the original 1939 “consolidated school”) and work with oxen. This would undoubtedly be a memorable experience! 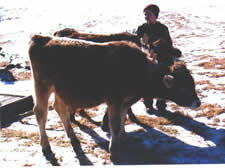 Again Thompson-Ames Historical Society is grateful to the Samuel P. Pardoe Foundation for funding both the ice-harvesting and “Oxen in History” outreach programs for Gilford’s fourth graders. Thompson-Ames Historical Society is a 501(C)(3) organization which depends upon volunteers and donations in order to carry out its mission to preserve and celebrate the history of Gilford. To learn more about Gilford’s historical society and its activities, please view T-AHS‘s website www.gilfordhistoricalsociety.org. A schedule of up-coming events is included in the Society’s publication “2006 Programs & Events” as well as on the website.